1 Break any of the larger pieces of walnuts in half. Heat a frying pan over a medium heat and add the walnuts. Stir continuously for 1–2 minutes, until warm, watching closely as they are easy to burn. Leave to cool. olive oil and honey in a bowl. toss through with the dressing. 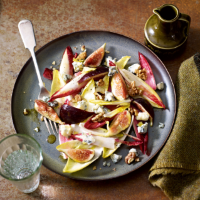 4 Spoon the chicory onto a large platter or plate, then place the fig quarters on top. Finish by topping with the walnuts and Gorgonzola. This recipe was first published in Tue Aug 19 12:32:00 BST 2014.